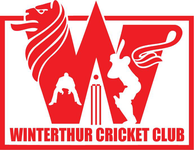 Winterthur took on last year's league champions, Nomdas Zurich cricket Club, in a friendly 40 over match at Deutweg on Sunday 19th April 2015. Winterthur's opening bowling partnership started well, restricting Nomdas to 19-2 off the first six overs. But Nomads brothers Azeen and Faheem were to prove unbeaten, both retiring on centuries after taking Nomads to 257-5, Nomads eventually completely their 40 overs on 352-8. Winterthur inngins also started well, Steve taking Winterthur to 63-2, before walking to a caught behind despite not being triggered by umpire A.Mackay. Winterthur then collapsed to 85-5. However, Winterthur captain Tom Mampilly, with the help of Parfull and Mahmood, steered the tail to a respectable 204ao 11 balls short of their 40 overs, to lose the game by a rather convincing 148 runs. To beat last year's champions was an ambitious objective and a very stern test for Winterthur, and although the ordeal proved to stern a test on this occasion, there were some positives to be taken from the game.